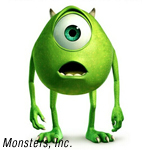 Monsters Inc. 2 is titled Monsters University! The long-awaited sequel to Pixar’s hit film Monsters, Inc. has a title: Monsters University. Disney confirmed at CinemaCon in Las Vegas both the title and that the new film will be a prequel to the 2001 hit film, with actors Billy Crystal and John Goodman reprising their roles as the voices of Sully and Mike. ComingSoon.net confirmed March 31 the Twitter rumors that Dan Scanlon (Mater and the Ghost Light) will be directing Monsters University, which is scheduled to arrive in theaters in 2D and stereoscopic 3D on Nov. 2, 2012.